“In the name of the President of the Republic, I declare the process officially closed and launch the start of the community reconstruction project within the framework of the implementation of DDR III in Ituri,” said DRC Social Affairs Minister Martin Bitijula. The social rehabilitation of 1,839 demobilized ex-combatants will now commence, out of a total of 4,665 initially targeted. “It is time to make communities of reception the privileged actors, in order to seal the reconciliation between them and the ex-combatants demobilized by the realization of this work for the common good,” added Minister Bitijula. He went on to say that the government decided to grant 72 hours grace to the armed groups of the FNI, MRC and FRPI to release all the combatants registered on the lists validated by the DDR phase III authorities. “It goes without saying that after midnight on 18 October 2007, the armed groups which have not surrendered all combatants and arms will be regarded as outside the law,” he underlined. The allusion was made to the FRPI militia of Cobra Matata who surrendered only 886 combatants out of the 2,600 registered, as the FRPI await ranks promised by the government for its officers before any disarmament. 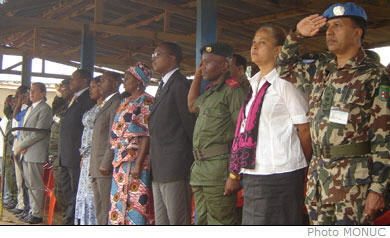 In an effort to reach a total pacification of Ituri the government granted 13 FARDC officer ranks to the FRPI militia on 6 October, 2007: two Colonels, four Lieutenant-colonels and seven Majors. 11 of the 13 FRPI officers officially received their ranks during the official DDR III closing ceremony. The two absent officers are already in Kinshasa for their military training. To date, about half of the 4,665 ex-combatants registered for the programme have been demobilized. The Congolese government and its partners such as the UNDP and MONUC hope that with the granting of these ranks to the FRPI officers they will reach the total number, before the closing of the disarmament points and transit sites on Thursday 18 0ctober 2007. With the technical results obtained, all recognize that Ituri is being pacified, because in the last two months, at least 1,120 weapons were recovered, 1,839 combatants disarmed and approximately 1,600 certificates of disarmament were issued. Also present at the ceremony was the Vice-Minister of Defense Mrs Yvonne Iyamlemye, the DDR national director Ntumba Luaba and the coordinator of the Military Integration Structure (SMI), Colonel Shulungu Nembeso. UNDP and MONUC Ituri officials were also present at the ceremony, as well as local political, administrative and military authorities. FRPI militia leader Cobra Matata whose officers received FARDC ranks was absent.